Thank you to Biohof Ziehlke and the merchants of the Winterfeldtmarkt! Benjamin (raumlabor) elaborating on his point. 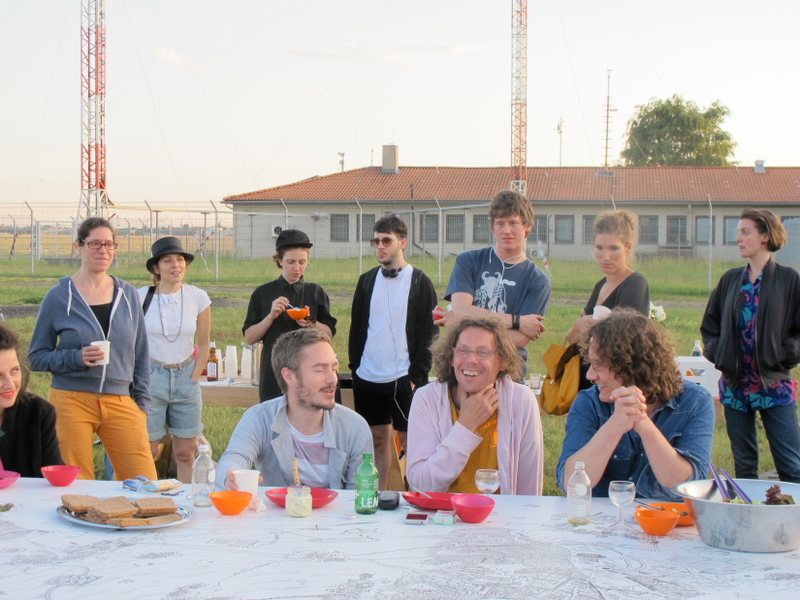 A few months ago we met Matthias Rick and Benjamin Foerster-Baldenius with the idea of establishing a temporary alliance between our TU Berlin Seminar on Experimental Architecture and raumlaborberlin for “Die Grosse Weltausstellung 2012”. 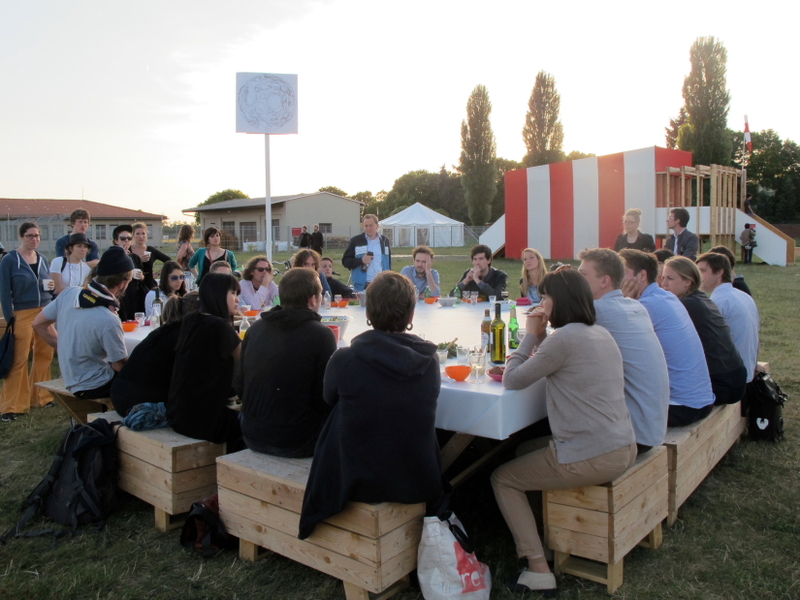 The seminar states itself as a platform where students, researchers, collaborators, friends and favourites meet to discuss urban activation processes. It intends to research forms of organization beyond the university context by encouraging thinking and acting on real time. The goal was to turn the drawing and its research into a statement. Later on, Valentina Karga joined the project and brought fresh ideas and expertise on how to built closed circuits that transform waste, basically leftovers or dead particles, into lifecycles. That is how our pavilion found its purpose. 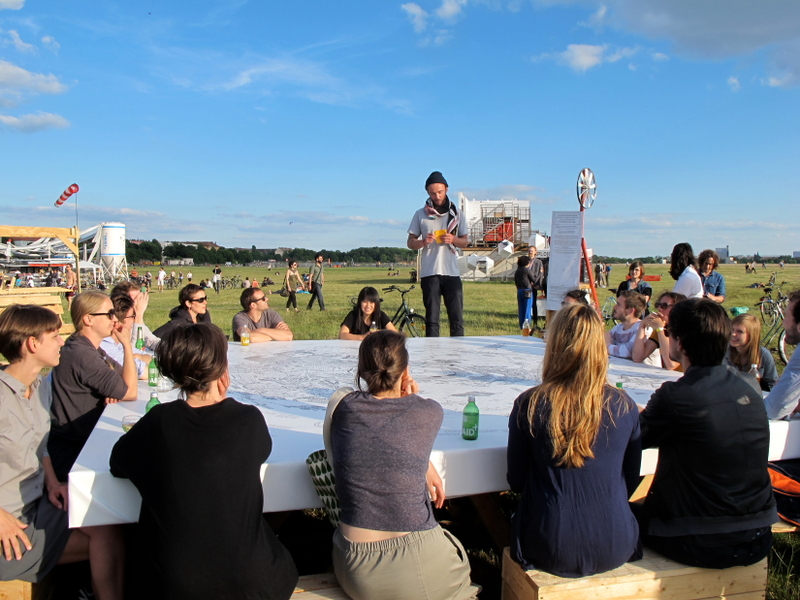 Dinner Exchange Berlin was chosen to provide the culinary framework for the project. The installation consists of different devices that activate processes, simple architectural elements around which workshops, dinners and collective gatherings happen. 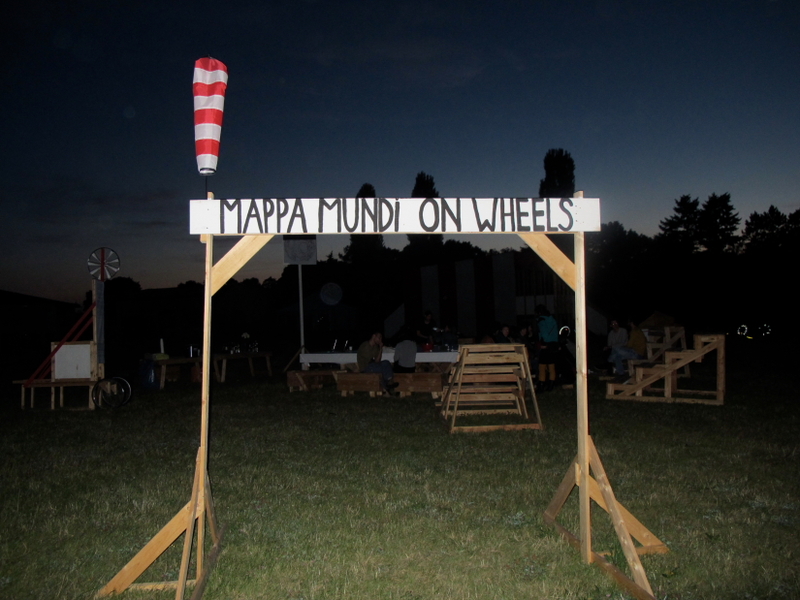 MAPPA MUNDI ON WHEELS acts as an infrastructure that ‘grows’ through a series of curated workshops dealing with public action, knowledge exchange and experimentation with do-it-yourself methods of production. 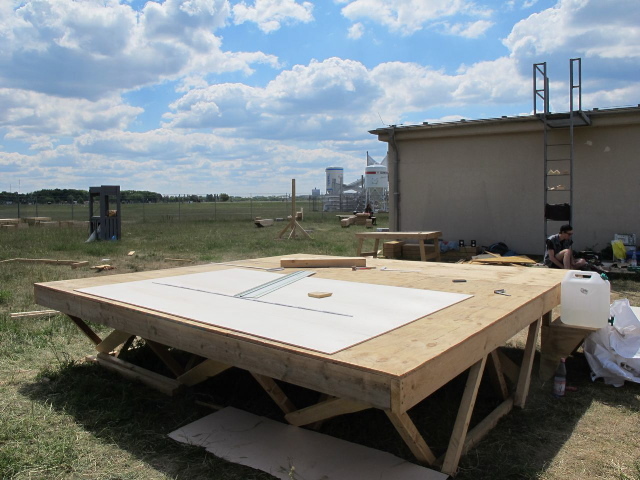 A mobile MAPPA MUNDI table, a greenhouse-rainwater collector, a worm farm, a windmill, events and workshops are parts of this pavilion-machine, which shows the world today and manifests a positive future. On the websites of Dinner Exchange Berlin and Berlin Farm Lab you will find the podcast, but you are very welcome to join the event! 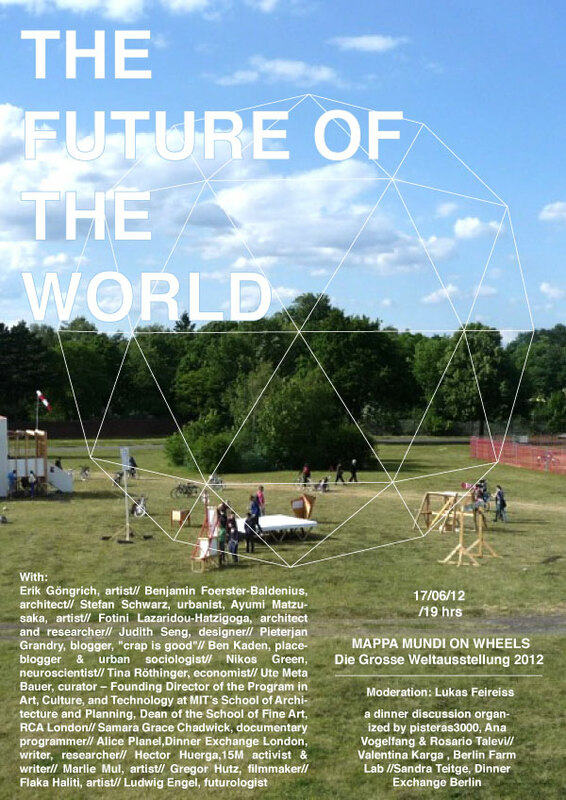 “The Future of the World” – a dinner discussion organized on Sunday, June 17th, 7pm, by pisteras3000 (Ana Vogelfang & Rosario Talevi), Valentina Karga (Berlin Urban Farm), and the Dinner Exchange Berlin within the framework of the Große Weltausstellung 2012, a collaboration between the HAU and raumlabor berlin. As a result of a workshop held during the third week of May together with the “Mediations” seminar, we created an installation whose main element is a large table with the Mappa Mundi, a beautiful drawing done by Matthias Rick (+), on its surface. The Mappa Mundi is an alternative representation of our planet today with regards to history and future, as well as to the matter of resources. 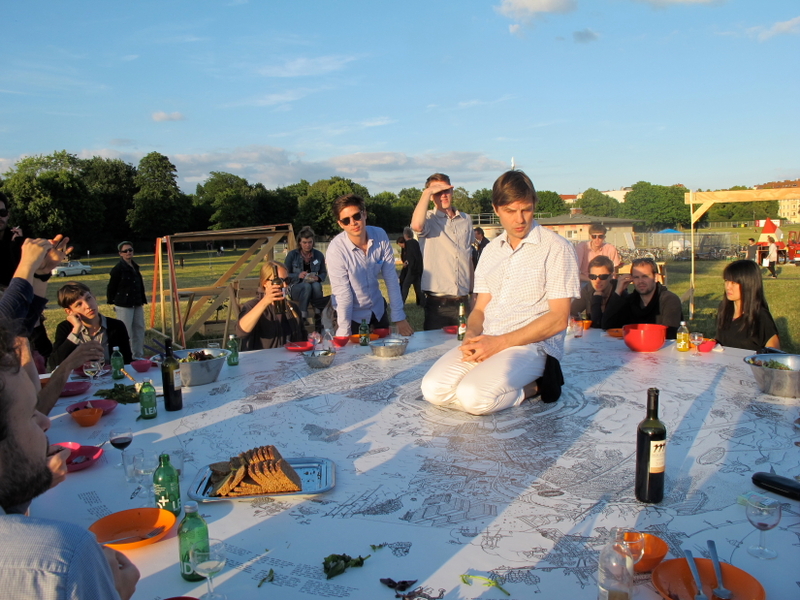 In this context we invited Dinner Exchange Berlin to organize a dinner with leftover food from markets. Our dinner guests will comprise a combination of people from different disciplines who will discuss the “Future of the World”. Curator and artist Lukas Feireiss will be moderating this event. We hope to initiate an inspiring discussion evolving around manifold aspects with regards to the future of our world.